Anyone that plays with little computers has seen articles about the DHT11 or DHT22 sensors. They're clever little humidity and temperature sensors that don't require calibration and measure the two factors we all complain about when discussing the weather: temperature and humidity. I've seen them, but actually never worked with one because, here in the desert, the humidity seldom gets out of the 20's. I've messed with a number of temperature sensors, but humidity didn't interest me much. That changed when my daughter and her husband bought a new house. It's (the house) one of the new energy efficient homes that is really well sealed up and even has solar panels. The energy efficiency actually works, they use a lot less energy than I do per square foot and the place is comfortable in all kinds of weather. The big drawback is getting smells and moisture OUT of the house. Suppose you're cooking dinner and have a couple of pots boiling on the stove, and the teenager takes one of those 20 minute showers they're famous for. The water build up in the house is huge. If the temperature outside is hovering around 20F, you can't really just open some doors and windows to air it out, so the water builds up until it becomes pretty uncomfortable. The steel front door starts to condense water and it runs down into a small puddle on the floor. The glass on the skylite (double paned, but covered with snow) starts to condense water and it drips on you when you stand under it. 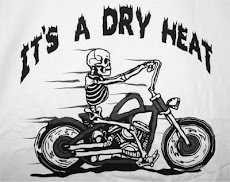 The solution is simple, air the place out and get rid of the moisture. No, the fan over the stove doesn't help much. She turns it on, but naturally the steam misses most of the hood and goes for the ceiling. Those fans and hoods over the stove aren't very useful. They need to be bigger and have an actual FAN in them, not one of those six inch noise makers. If I have to listen to a fan, it really should actually be doing something. I suggested they measure the humidity and see what is going on, so they can decide which of several methods they need to try to remove the water floating around, but my daughter had another idea, "Dad, why don't you make me one?" 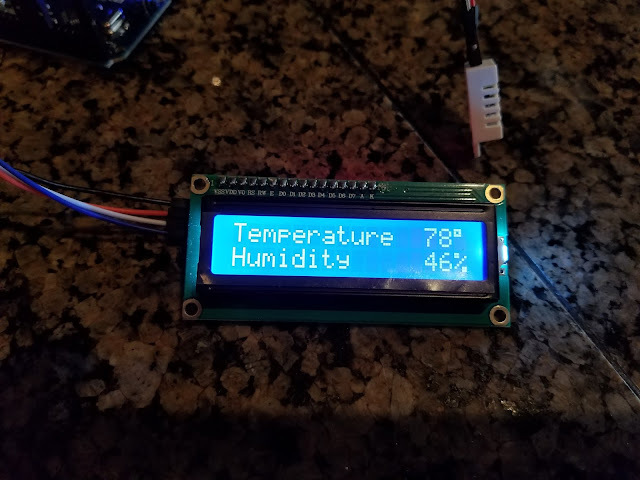 I got to try out the I2C input serial LCD displays and the sensor. It was a fun little project that took about three hours rounding up all the right libraries to make the devices talk. It took me a heck of a lot more time ordering and receiving the pieces. 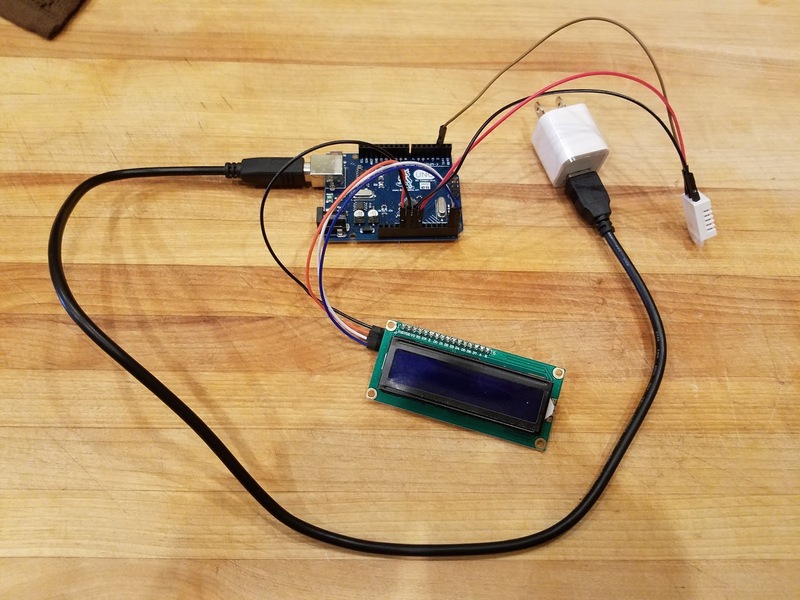 Of course, I already had the Arduino, cable, and sensor, but the display and sensor came from way far away. It just works; no messing around with calibration or strange problems. Yes, I know you can buy these things for a few buck off Amazon or whatever, but where's the fun in that? Also, I managed to make a deal where I build it, and they figure out an enclosure that suits their taste. That was totally evil of me. The hardest part of this kind of project is enclosing it inside something and making it look nice, and I totally passed the buck on that part. Total win for me. Plus, the kids can say, "Grandpa built that."